In What’s the deal with sugar? Part 1, we learned the recommended maximums for sugar intake, blood sugar definitions, what can happen if you eat too much sugar, and you had the opportunity to be an added sugar expert! In Part 2, we’ll be clearing up the confusion around the many different names for sugar and answering the question, which sugar is best for me? Before we look at the different types of sugar, let’s see where sugar comes from. When we say sugar, what we mean is sucrose. Sucrose is found in the stems of sugarcane and in the roots of the sugar beet plant. To extract sugar from sugar beets, the beets are sliced and soaked in hot water to separate the sugar from the rest of the plant. The hot liquid, now molasses, is then filtered, concentrated, and rapidly spun in a turbine until the molasses is flung off and solid sugar crystals remain. To extract sugar from sugar cane, the stalks are shredded and squeezed to release its natural juice, which is boiled until it thickens and sugar crystals begin to form. Again, the crystals are rapidly spun to remove molasses, leaving just the sugar crystals behind. Now that we have a background on where sugar comes from, let’s go over sugar’s many different names. Keep in mind that some foods can contain multiple forms of sugar at once! Added sugar: Sugar and syrups that are not naturally occurring in food but are added to food during processing or preparation. Added sugars are used to enhance the flavor and texture of food and to help food stay fresh longer. The American Heart Association recommends that men consume less than 36 grams of added sugars a day or 9 teaspoons and that women, children, and teens consume less than 24 grams or 6 teaspoons. Keep in mind that children under two should not be given added sugar. Examples: Foods with sucrose and high fructose corn syrup like cookies, cakes, sports and energy drinks, sodas, jams, dairy desserts, sweetened yogurts, sugar added to coffee or tea, baked goods like cinnamon toast, and so many more. Natural sugar: Sugar that is naturally occurring in food. Food containing natural sugar also tends to have nutrients like vitamins and minerals that sugar alone does not provide. These foods also tend to have fiber, which slows down your body’s absorption of the sugar. Examples: Fruit and sugars occurring in vegetables, which contain both natural sugar and fiber. Milk, milk products like unsweetened yogurt, honey, and agave nectar, which contain natural sugar but no fiber. Total sugar: Total sugar is made up of the added sugar plus the natural sugar in food. Right now, the nutrition facts label lists the total sugar in packaged foods. 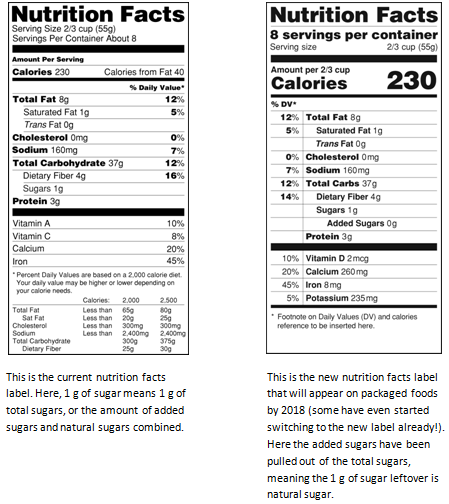 In 2018, the facts label will include a separate line for added sugars, separating it from natural sugars. This will help shoppers see how much sugar was added by manufacturers vs. how much sugar was in the product naturally. Caloric sweetener: Also known as nutritive sweetener or sugar. These sweeteners have calories and provide energy in the form of carbohydrates. Examples: Sucrose, glucose, fructose, high fructose corn syrup, syrup, honey, agave nectar, Raw sugar, granulated sugar, brown sugar, confectioner’s sugar, turbinado sugar, and more. Non-caloric sweetener: Also known as non-nutritive sweetener, very low-calorie sweeteners, artificial sweeteners, non-caloric sweeteners, or intense sweeteners. 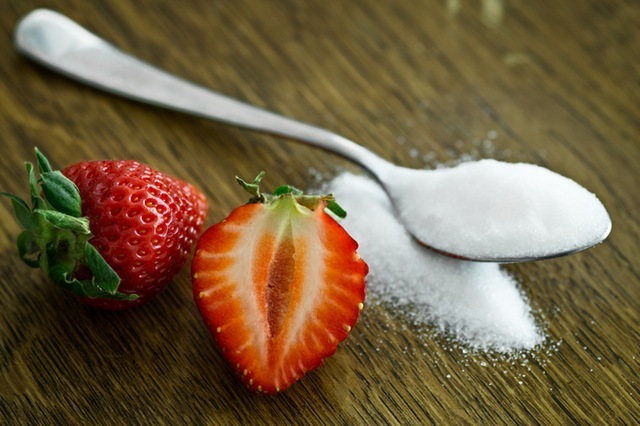 Compared to their caloric counterparts, non-caloric sweeteners are not actually sugar, and they are zero- or low-calorie options due to the fact that they are not completely absorbed by your digestive system. They also tend to be much sweeter than sugar, so only small amounts are needed. Sucrose: This is your common table sugar. It comes from low-sugar beet juice or sugar cane. You might add a form of sucrose to your morning coffee or sprinkle it on your cereal. It is used most often in home baking. Lactose: Sugar that is naturally present in milk and milk products. Fructose: Sugar that is naturally present in fruit, vegetables, and honey. Fructose tends to be naturally sweeter than sugars like glucose and sucrose, which is why manufacturers add it to sodas and sweets in the highly processed form of high fructose corn syrup. Honey: A combination of fructose, glucose, and water. It is produced by bees. Corn syrup: A sweet syrup made from corn. It has almost the same level of sweetness as high fructose corn syrup. High fructose corn syrup (HFCS): A liquid mixture of glucose and fructose made from corn that is only available to food manufacturers. Food manufacturers like to use HFCS because of its high level of sweetness and affordable cost. It is used to sweeten baked goods, soda, and some canned products. You might have heard people blaming high fructose corn syrup for the obesity epidemic but right now there is little evidence that HFCS affects the body any differently than sucrose and other caloric sweeteners. However, experts say more long-term studies still need to be done before this can be known for sure. Examples: HFCS is commonly found in soda and processed baked goods. It’s used as an additive for many types of food, so be sure to check the ingredients list to see if it’s present. Agave nectar: A highly processed type of sugar from the Agave tequiliana (tequila) plant. Agave nectar is about 1.5 times sweeter than regular sugar and has more calories per tablespoon than the same amount of table sugar. Though it comes from a plant, agave nectar is not healthier than any other caloric sweetener. Maple sugar: Sugar from the sap of maple trees. Maple sugar is made by boiling the sap until all the water has been boiled away, leaving solid sugar at the bottom. It consists of sucrose, fructose, and glucose. Invert sugar: A liquid sugar or syrup made from sucrose, it is used to keep candies and baked items sweet. Refined sugar, white sugar, or table sugar: The refined version of sugar after molasses has been removed from the juices of sugar cane or sugar beets. This is the most commonly used form of sugar in home cooking and is what most cookbook recipes call for. Sugar In The Raw, or turbinado sugar: Sugar In The Raw is the brand name for turbinado sugar, and is the result of sugar crystals not flinging off all of their natural molasses during the extraction process of sugar cane. Like white sugar, turbinado sugar is spun in a cylinder or turbine (which is where it gets its name) but is removed before further processing to maintain a light brown color and mild molasses flavor. Other names for turbinado sugar are factory, raw, natural, demerara, and muscovado, unrefined or partially refined brown sugar. Let’s test what your new sugar knowledge! Now that you know more about the differences between types of sugar, try to apply what you’ve learned to these two activities. 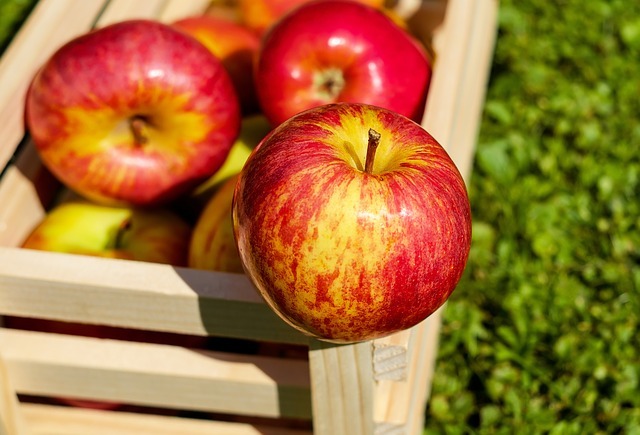 What kind of sugars might this apple contain? 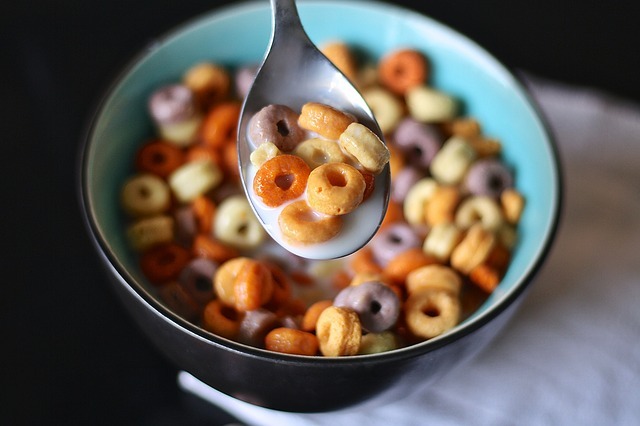 What about this bowl of cereal? 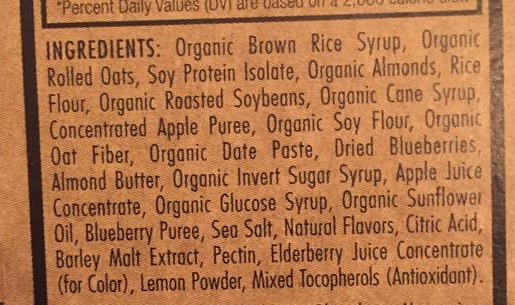 See if you can spot the different forms of sugar in this energy bar’s ingredients list! To be clear, sugar is not a healthy choice and should be enjoyed in moderation. There are certain types of sugar that are smarter options than others though. The “best” sugar to choose is sugar contained naturally in foods that are also rich in nutrients and fiber, such as whole fruits and root vegetables like beets and carrots. Calorie wise, using non-caloric sweeteners in place of caloric sweeteners can help reduce the amount of calories you eat a day, though experts do not agree on whether their use leads to weight loss. If you’re going to consume added sugars, whether from the sugar shaker or in processed foods, follow the American Heart Association’s recommendation of limiting your added sugars to 36 g a day for men and 24 g for women, or 9 and 6 teaspoons, respectively. Keep in mind that eating too much added sugar can increase your risk for weight gain and health issues like high blood pressure and Type 2 diabetes.